Gunmen opened fire on a bar in the Mexican state of Veracruz Thursday, killing six people including a local boss of the Zetas drug cartel and a journalist, officials said. 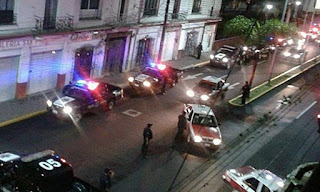 Five men wielding high-power guns burst into the bar in the eastern city of Orizaba, shooting dead journalist Juan Heriberto Santos and Jose Marquez Balderas, a local Zetas boss known as “El Chichi,'' in addition to four others, the state government said in a statement, citing witnesses. Two police officers were wounded, one seriously, as officers unsuccessfully tried to chase down the gunmen after the attack. Two other journalists were also in the bar but were unharmed, officials said. The editor of the local newspaper where they work, Luis Dominguez, said the two reporters told him the gunmen sprayed Santos with bullets then kicked him in the head “in a tremendous rage'' before leaving the bar, a popular hangout with local crime reporters.